No Need to Leave Home During the Refinishing Process Our New Dust Containment System Virtually Eliminates Dust In Your Home. Have you dreaded refinishing your hardwood floors for fear that the process is all about dust? Brothers Flooring offers a premium Dustless Hardwood Floor Sanding Finishing service! What is the Atomic Dust Containment System? Mounted on a trailer outside, a separate dust collector is powered by a 27-HP Water Cooled Kawaski Engine. 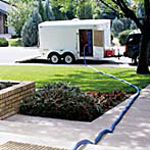 A 2-inch hose connects the sander, edger and buffer to the vacuum system located in the trailer. 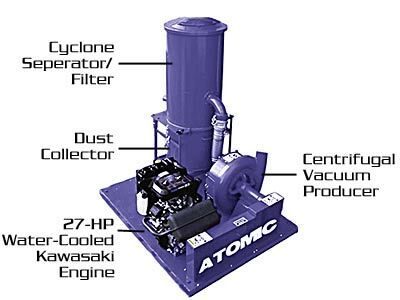 The innovative concept of the Atomic system, having a 27-HP engine driving a dust collection system outside of your home significantly increases airflow. The result is a dramatically more powerful system, providing evacuation of the airborne dust that is generated from the total sanding process. As consumers have become aware of their dust-free sanding choice and don’t want to put up with the mess, and dust containment has become a very popular premium service offered by Brothers Flooring. Eliminates the chance of dust throughout the home.